We presented a female patient a 63 year-old affected with scabies and personal history of previous athropatich psoriasis and arterial hypertension. 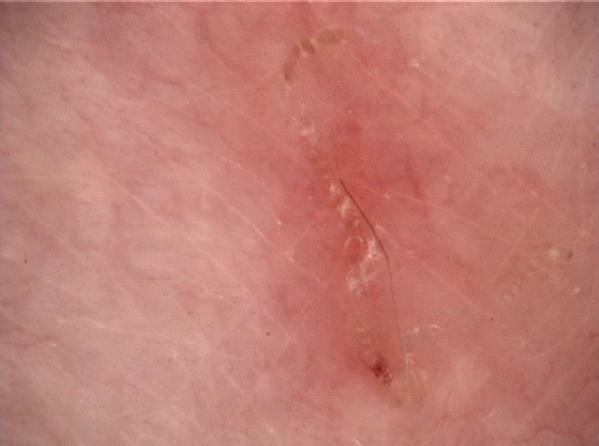 We aimed to desribed clinically widespread itchy rach vs scabies submited to dermoscopic examination. We confirmed diagnosis of scabies clinically and dermoscopically. Zaprezentowaliśmy 63 letnią chorą na świerzb z osobistą dodatkową historią w postaci łuszczycowego zapalenia stawów i nadciśnienia tętniczego. Naszym celem było opisanie klinicznie powszechnych, swędzących zmian w przebiegu świerzbu obserwowanych w badaniu dermoskopowym. Potwierdziliśmy rozpoznanie świerzbu badaniem klinicznym i dermoskopowym. Scabies is an itchy rash caused by a little mite that burrows in the skin surface. Scientific name of human scabies mites is Sarcoptes scabiei var hominis. The mite is an obligate human parasite and cannot live more than three days without a human host, but it can survive up to a month when living on a human. The life cycle of the mite lasts 30 days and is spent within the human epidermis. An affected host is infested by about 10-12 adult mites. After mating the male dies and female mite burrows into the outside layers of the skin where she lays up to 3 eggs each day for her lifetime. The period of 10 days is needed for maturation through larval and nymph stages. At the end, 10% of those eggs arise in mature mites . The symptoms of the condition can last for months or even years. Scabies is a very contagious skin condition. The mites are transferred by direct skin-to-skin contact also during sexual contact. Others, indirect contacts etc. over bedclothes, are also possible if these have been contaminated by infected persons. Symptoms will appear from two to six weeks in people who have not previously been exposed to scabies infection. In patients with previous infestations symptoms develop whitin one to four days after . Although scabies can affect anyone of any age, race or socioeconomic group, it is more common in children and in sexually active people. Itch is often severe. Itch tends to be in one area at first (often the hands), and then spreads to other areas. The itch tends to be worse at night and after a hot bath. A rash usually appears soon after the itch starts . The rash is often most obvious on the inside of the thighs, parts of the abdomen (fig. 1) and buttocks, armpits, and around the nippels in women (fig. 2). Scabies is usually diagnosed by the typical symptoms and lesions and skin rash described above. Typically primary symptoms are small papules, vesicles and burrows. Secundary lesions might be various because they are the result of scratching, due to scratching attained secondary infections and sometimes outcome of the host immune response against the mites and their products. The diagnosis can be confirmed by microscopic examination of the contents of a burrow . Burrows are a pathognomonic sign and represent the intraepidermal tunnel created by the moving of female mite. Burrows are often shaped like „s“ or „z“, (fig. 3, fig. 4). Using dermoscopy we could also see the classic dermoscopic image of triangle or „delta wing jet“ sign of scabies head parts, translucent scabies body and scabies eggs (fig. 5), common seen under the breasts (as in our patients case), axillae and buttocks. A new technique, dermoscopy, makes it easier to identify the black dot at the end of a burrow which represents the mite. Examination with our Mole Max II digital dermoscope, which offers a maximum field of view of 1cm with 30-fold magnification, revealed scabies mites within minutes. The pixel resolution of each image was 640×480 at 24-bit color depth [5,6]. Our patients were treated with topical Eurax® (Crotamiton) cream/lotion which is a scabicidal and antipruritic agent. Itch disappeared almost immediately. After the treatment, skin condition was without any changes. We conclude that dermoscopy as a accurate, non-invasive, painless, non-expensive and simple technique is important and useful tool for the diagnosis of scabies either as a diagnostic test or to guide the traditional diagnostic test . Dermoscopy of scabies facilitate very low number of false-negativ results what we conceive as significant because scabies moreover may additionally mimic a host of other dermatologic conditions that can be easily misdiagnosed if not confirme. 1. Fox G: Diagnosis of Scabies by Dermoscopy. BMJ Case Reports 2009; 10: 1136. 2. Neynaber S, Wolff H: Diagnosis of Scabies with Dermoscopy. CMAJ 2008; 178: 1540-1541. 3. Dupuy A, Dehen L, Bourrat E, Lacroix C, Benderdouche M, Dubertret L,et al: Accuracy of Standard Dermoscopy for Diagnosing Scabies J Am Acad Dermatol 2007;56:53-62. 4. 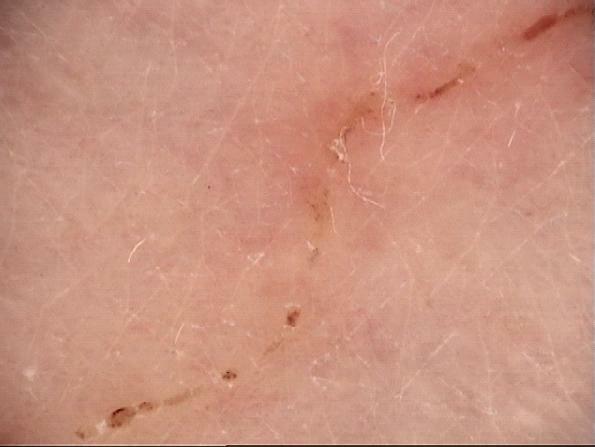 Prins C, Stucki L, French L, Saurat JH, Braun RP: Dermoscopy for the in vivo Detection of Sarcoptes scabiei. Dermatology 2004; 208: 241-243. 5. Johnston G, Sladden M: Scabies: diagnosis and treatment. BMJ 2005; 331: 619-22. 7. Cordoro KM, Wilson BB, Kauffman CL: Scabies. EMedicine. 2009; www.medscape.com.